The Young Men's Christian Association building on the northwest corner of Fourth and Waters Streets was built in 1911. Over $50,000 was raised by members of the community for construction on the new building. The site was donated by Mr. & Mrs. Sam Pearson. 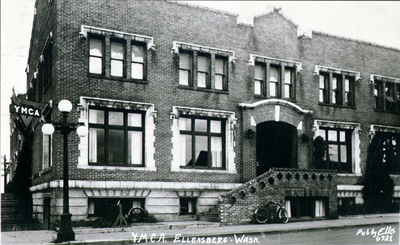 In 1980 the Fraternal Order of the Eagles Aerie #2220 of Ellensburg purchased the former Y.M.C.A. building from the Catholic Church.Ellis photograph postcard titled: "Y.M.C.A. Ellensburg Pub. by Ellis #6921". On reverse Dec. 1, 1949 Ellensburg postmark, one cent stamp. Handwritten letter in pencil written to Mildred from Mother and addressed to Mrs. L. E. Wilson...Seattle 22, Wash.
Ellis, "Y.M.C.A. Building II" (1945). Ellensburg History Photographs. 21.